I met an astronaut! Is that crazy or what? I still can't quite believe. 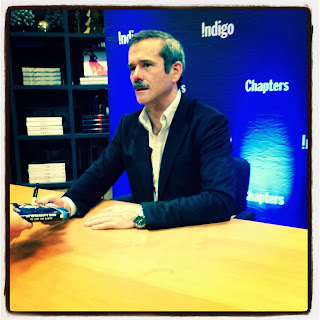 Last night after work, I wandered over to my favourite post-work hangout, Indigo, got my coupon (Group 5) and then strolled around the shops until 7pm when Commander Chris Hadfield would appear for a book signing. Not just any book signing, but his own book, An Astronaut's Guide to Life on Earth. It was a long wait. I won't deny it. Was it worth it? Yes. A hundred times, yes. 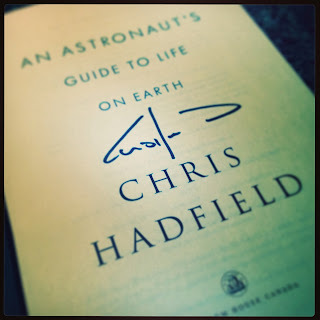 Mr. Hadfield was kind, smiled and apologized for the long wait. How Canadian of him, eh? CH: Hi there. Sorry about the long wait tonight. ST: Hello. No please, it's an honour to meet you. ST: Sooo ... what's your personal best on a 5km? CH: (Looks up, surprised) Oh, I don't know! I just run until my heart goes fast. ST: Alright. Well, thank you very much. Have a good rest of the evening. CH: Thank for coming, have a good night. I MET AN ASTRONAUT, PEOPLE!!!! Your niece and nephew are very jealous. Me too.